Many thanks to all who provided their input on the upcoming birthday celebration. We’ve solidified the lineup, expect to see PS3, 1TB HDD and heaps more. We’ve decided to make it a two day fling, with the whole shebang starting Monday at midday (that’s eastern time for you westside folks). Expect to see one awesome deal every hour, on the hour (uptil midnight on Monday, and then starting 9am on Tuesday until midnight again). We’ve invested thousands of dollars into our server infrastructure and expect to handle more traffic than before, but we strongly advise that anyone who might feel a bit frustrated by server crashes give both days a miss – CatchAThon will be on Wednesday with many hundreds of bargains. For everyone else – I hope you enjoy the event. We’ve cooked some really great deals. 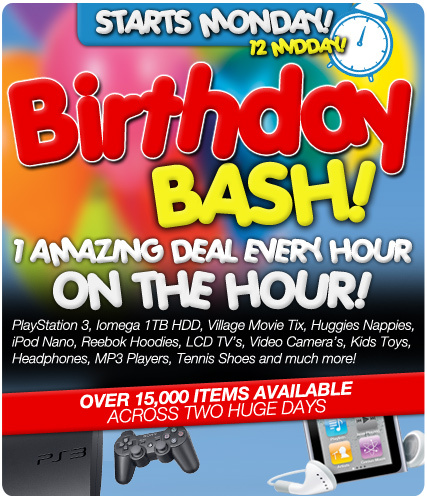 In addition to the hourly deal, on our Facebook page we will be hosting hourly giveaways and competitions. Make sure you “Like Us” to keep informed. Thanks again for your amazing support over the last four years – see you Monday! Previous Previous post: Coming Up – One Helluva Party! Next Next post: CatchOfTheDay Turns 4!